The theoretical study of translation doesn’t enjoy wide renown. Both branches of research which comprise this field are, for a range of reasons, treated with some reserve, and their juxtaposition does more to deepen than to remove doubts. The interviews with seventeen translators collected by Adam Pluszka in Wte i wewte [Back and forth] provide the reader with illuminating insights into the process of translation. Each of these approximately 20-page conversations focuses on a different aspect of translation, as seen through the eyes of translators whose background and experience vary. 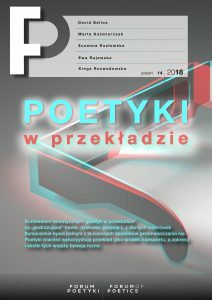 A few dates: it has been 50 years since Poetyka przekładu artystycznego (The Poetics of Creative Translation)1 was first published. In this article, Edward Balcerzan, a young researcher of literary translation and a translator of poetry postulated that the poetics of translation should become the subject of rigorous literary study. Engagement with literature, like all forms of contact, always lies somewhere between the pleasurable and the unpleasant. Reading and translating are activities which engage the body doing the experiencing – whether somatic, sensual or sexual.